Rob and I don't really do "Valentines Day", what I mean is, we normally don't go out for an expensive dinner, buy each other expensive presents, nor do I get a big bouquet of flowers. In the past I've always made a nice dinner, we exchange cards and a small gift. Ok, after reading that, I guess we do, "do valentines day", just in our own way, but this year was a little different. We decided to go out for dinner this year, because Valentines Day happened to fall on a Saturday (just like our very first one together), and because it happens to be a long weekend, and we normally go out for dinner on long weekends to give me a break from cooking. We went to "Snug Harbour" in Port Credit. We had planned on going there last month, but a snow storm kept us away. We had been there for lunch before but never dinner. It's a nice but casual restaurant on the water. We had a nice water view table. The sun was just starting to set when we arrived and it was very pretty. We were having a drink, sharing some appetizers and talking when we noticed some activity on the water. We saw lots of Canada Geese, about 10 Swans, a few Mallard Ducks, and something we had not seen before, Bufflehead's! When Rob and I see a new bird together it is always exciting for us. We had fun watching the 3 or 4 males (pictured, the females are grey-brown) diving for food and swimming around. Their appearance made our Valentines day dinner just a little more special. After coming home we exchanged cards and a small gift, but I know we both will remember the Bufflehead's most, and think of seeing them as an unique gift for the two of us. 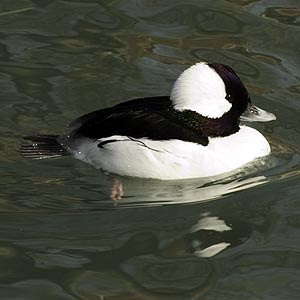 I wouldn't be surprised if we made an annual Valentines day outing to the Port Credit harbour to see them, because in my mind, the Bufflehead will always be my Valentine Bird. We've been to Snug Harbour ... it's a nice place to spend Valentine's Day!